Powell’s Books is an icon of independent booksellers and for those living in Portland it’s an institution. As a kid growing up in the suburbs though, I had no idea how special Powell’s was. Instead, it was rather intimidating. In the 1980s and 90s, as I was growing up, Powell’s was on the outer edge of downtown surrounded by warehouses and railroad switchyards. Wikipedia nicely says this location was “edgy.” Powell’s itself still feels like a converted and pieced together warehouse: Tall ceilings (tall bookshelves), a patchwork of floors at different levels with what seems like Hogwarts-style staircases, and concrete floors. For a suburban kid more used to big-box retail stores, this was intimidating. But it’s these qualities and more that make Powell’s awesome. By middle school I learned to love the seemingly endless bookshelves of all types of subjects. I love that Powell’s sells used books with just as much passion as new. I love that Powell’s, despite its size, still takes the time to have employees write shelf tags to guide browsers and highlight books. I love Powell’s technical bookstore— an entire bookstore devoted to just the sciences located across the street from the main store. This store doesn’t have the quiet and close feeling you might get at a smaller store. The concrete floors and high ceilings ensure that. It’s a warehouse with just about every book you could imagine. And that’s what makes it awesome. When you visit Powell’s today, it’s not in that edgy location it grew up in. The Pearl District (as it’s now called) started receiving public development monies in the late 90s and early 2000’s causing it to transform into one of the hottest retail and residential areas in the city. 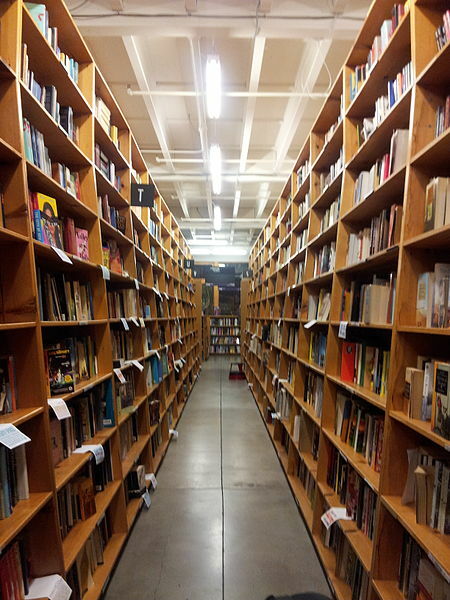 Powell’s itself has undergone some storefront construction, but it remains true to it’s roots and more popular than ever. Also at four other locations, including the Portland Airport. What’s your favorite bookstore? Read all of our Bookstore Love stories!